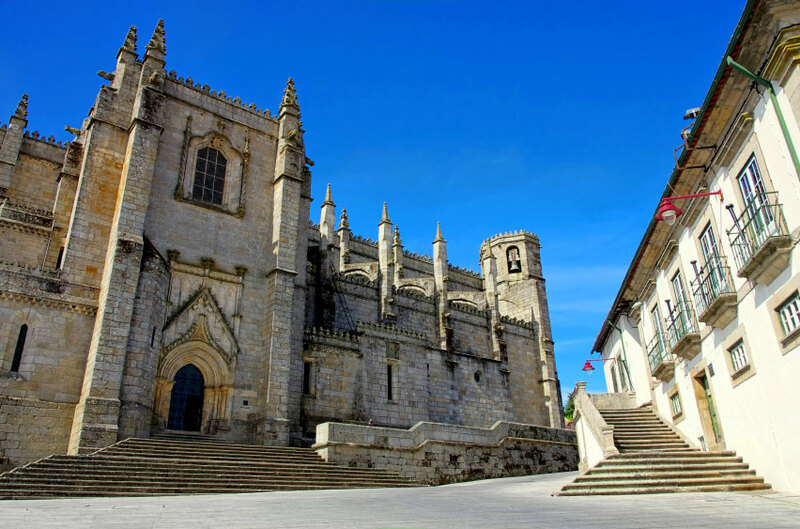 Its proximity to the Spanish border means that this whole area of the Beira region is dotted with fortifications and hilltop villages, and Guarda is no exception. Indeed its very name is an indication of its 'guarding' role. It served its purpose well under the Duke of Wellington against the French in the Peninsular War of the 1800s. The highest town in Portugal, at over 1000 metres above sea level, its defending walls were put in place by the 12th century King Sancho I and much still remains to be seen today, including three original portals. Its location has also earned it the reputation of being one of the coldest towns in the country, its most famous son, the poet Augusto Gil, famously describing the arrival of snow in his poem 'Luar de Janeiro'. Also perhaps owing to its important historical function and location, the overall feel of the architecture here is one of somewhat austere and solid simplicity. However, the cathedral does display some interesting Manueline flourishes incorporated comfortably into its overall Gothic style. The interior is even more attractive, with a decorative 16th century altar carved from white marble. Praça Velha, the main square, has some ground level arcading typical of the area with robust granite pillars. The town's museum offers displays of local archaeological unearthings and connected to Augusto Gil. The ancient Jewish district, the Judiaria, has also retained much of its 14th century charm and even bears a plaque affirming friendship between Portugal and Israel. One house of particular note in these narrow alleys is that of the famed Jewish shoemaker Barbadão. His beautiful daughter Inês won the heart of King João I and bore him an illegitimate son, Afonso, who was subsequently bestowed with the title of Duque de Bragança. Many years later, descendents of this union did indeed rule the country. Local folklore tells us that Inês' father earned his nickname Barbadão (literally 'heavily bearded') from his reaction to the relationship, his refusal to ever shave again. In a similar vein, the nearby village of Belmonte still has a strong Jewish community with an active synagogue and a museum dedicated to their continued presence in Portugal. It is also the birthplace of Pedro Alvares Cabral, the man credited with the discovery of Brazil in 1500, whose family changed the village’s 13th century castle into their own grand accommodation. Other nearby treasures include the ancient atmosphere of the village of Celorico da Beira, with its impressive castle and nearby solitary standing stone. It is also renowned as the capital of the typical local soft cheese, the queijo da serra. Literally translated as the cheese of the mountains, it is made from the milk of ewes grazed on the slopes of the surrounding hills of the Serra da Estrela. A market dedicated to this winter product is held between the months of December and May. Also, the village of Linhares is widely reputed to be one of the most scenic of the country with its ancient granite buildings and archways. The parish church boasts a handful of paintings by Grão Vasco and, on a more modern note, the lofty Linhares is a popular centre for hang-gliding with a well-equipped school and annual national competitions.